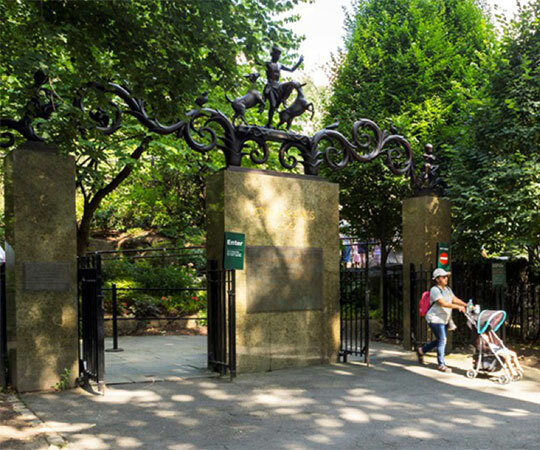 Welcoming visitors to the Tisch Children’s Zoo is the Lehman Gates, a fanciful entrance that fittingly celebrates the interaction of children and animals. Three granite pillars are topped by a long bronze sculpture in a form of a spiraling vine that integrates animals and human figures, providing an archway over the Zoo’s entrance. Above the center pillar, a young boy dances with goats to the music of two smaller boys playing the pan pipes on top of the pillars at each end. Birds resting on top of the vine appear to join the performance with their song. 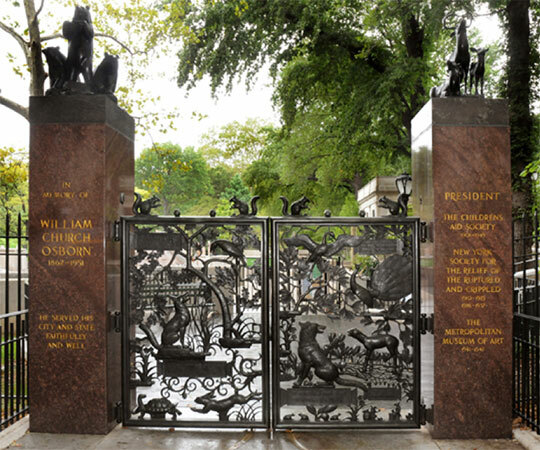 The Lehman Gates, designed by Paul Manship, honor Governor and Mrs. Herbert H. Lehman, who donated funds for the construction of the Children’s Zoo. The sculpture is by Paul Manship, the acclaimed American sculptor associated with the Art Deco movement in New York. Manship is most well-known for the Prometheus sculpture located above the Lower Plaza at Rockefeller Center. With three works in Central Park, he is also one of the most well-represented artists in the Park. Earlier this year, the Conservancy applied a new protective coating to the sculpture, part of an ongoing program of work to maintain Central Park’s collection of statues and monuments. This project inspired a deeper consideration of Manship’s body of work in Central Park, which also includes the Osborn Gates at the entrance to Ancient Playground, and Group of Bears at the entrance to Ruth and Arthur Smadbeck-Heckscher East Playground. These three sculptures are more than just important examples of Manship’s public art; in Central Park, they are part of a larger tradition of playful sculpture associated with landscapes and facilities for children. When the Children’s Zoo opened in 1961, Manship’s elegant gate led kids to another sculptural ensemble — though one inspired more by Disney than Deco. In addition to the various animals, the Zoo also featured what The New York Times described as a “fairy tale world,” comprised of structures inspired by Noah’s Ark, The Three Little Pigs, Alice in Wonderland, and other stories. One of the most prominent features was a huge blue whale, made of plastic, with a gaping mouth that children could climb into. 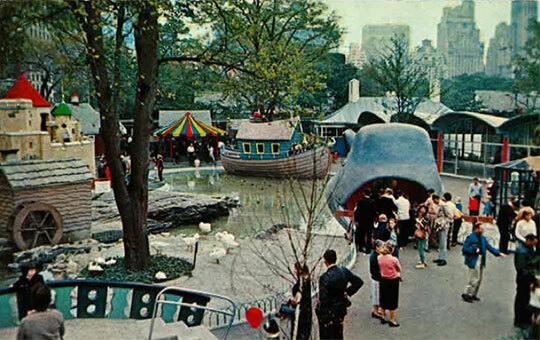 The Children’s Zoo originally contained what The New York Times described as a “fairy tale world” of animal sculptures and other structures. Manship’s other works in Central Park also mark the entrances to children’s worlds. And like the concept for the Children’s Zoo, they reflected the prominence of children’s stories and animals defining spaces for children. Manship’s earliest work in Central Park marked the entrance to a playground. 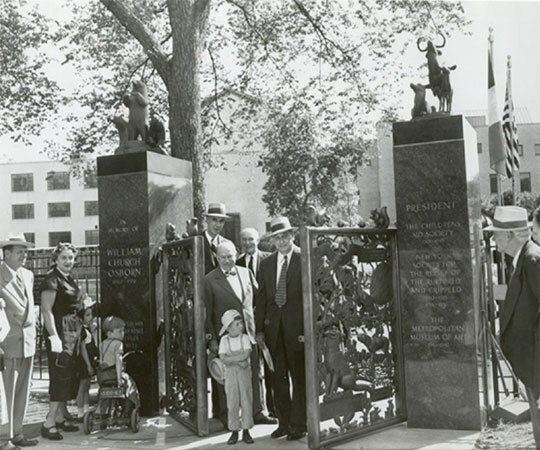 The Osborn Gates were commissioned in 1953 and installed in a new playground dedicated to William Church Osborn, a former president of the Metropolitan Museum of Art and the Children’s Aid Society. Parks Commissioner Robert Moses attends the dedication of the Osborn Gates, Manship’s earliest work in Central Park. Source: NYC Parks Photo Archive. The Osborn Gates, commissioned in 1953, marks the entrance to Ancient Playground, where it was moved to in the 1970s. His choice of children’s literature as a subject also reflected a broader trend for sculpture in Central Park during the mid-20th century, which saw a shift away from monuments commemorating famous men to sculptures with more playful themes intended to engage children. This interest was related to NYC Parks’ installation, beginning in the 1930s, of new facilities for recreation, including playgrounds, a skating rink, and ballfields. Sculptures intended for children reflected a vision of the Park as a place for leisure and play, but one that was more organized and programmed than the Park was in the 19th century. In 1959 — shortly after the unveiling of the Osborn Gates — Alice in Wonderland, still the most beloved of this type of sculpture, was installed near Conservatory Water. Nearby, young visitors could find the sculptures Mother Goose and Hans Christian Andersen. All these works of art clearly defined spaces and activities for children’s play. 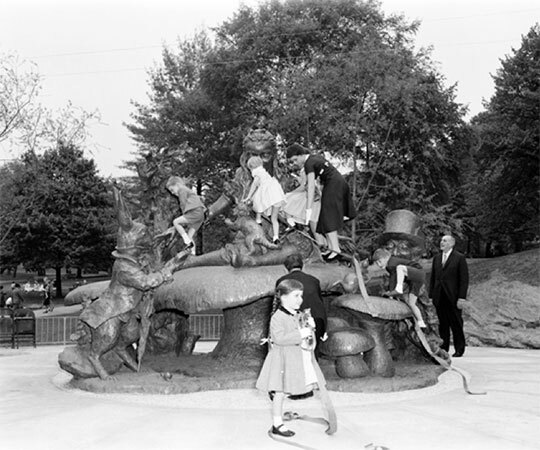 Alice in Wonderland, installed in 1959, was part of a trend of sculptures with playful themes intended to engage children. Source: NYC Parks Photo Archive. Manship’s last work to be installed in Central Park also marks the entrance to a playground — but with a very different form. Group of Bears is a large sculpture depicting three bears on a stepped pedestal. The central bear, standing on its hind legs, is over seven feet tall and flanked by two bears on all fours. For some Park visitors, Group of Bears may look familiar. In fact, there are two other versions of this ensemble nearby, one at the Metropolitan Museum of Art and another much smaller version that sits atop one on of the pillars of the Osborn Gates. This motif derives from one of Manship’s earliest and most-well known projects, the Rainey Memorial Gates at the Bronx Zoo, which incorporates three bears in profile. 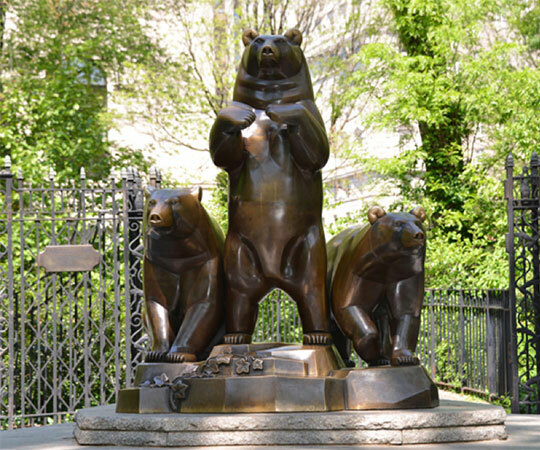 Like Manship’s other works in Central Park, Group of Bears was a result of philanthropic investment in the Park. This sculpture, installed in 1990, was donated by Samuel N. Friedman in memory of his wife, Pat. Group of Bears is in a small plaza in front of the Ruth and Arthur Smadbeck-Heckscher East Playground; in addition to its subject, Group of Bears is also appealing to children and a fitting entrance to the playground because it is one of a few sculptures in Central Park that children are allowed to climb and play on. This sculpture relates to other animal play sculptures in the Park. The most well-known is Balto, which is also the earliest example of this type. Installed in 1925 as a monument to the heroic Alaskan sled dog, it relates to the earlier purpose of public art to commemorate and memorialize. It became pilgrimage site for children, whose years of touching and climbing have given the bronze a particular patina. A more recent example can be found in Safari Playground, also known as Hippo Playground, which incorporates 14 hippo sculptures by the artist Bob Cassilly. Exploring the work of Paul Manship in Central Park broadens our understanding of the Park’s collection of works of art — not only illustrating how this collection includes many superb examples of the history of public art in New York, but also that it encompasses much more than commemorative monuments. Manship’s works, celebrating play, animals, and children’s stories, connect to the Park’s purpose to inspire wonder and excite the imagination. The conservation of the Lehman Gates was generously funded by American Express.